Hassium is a synthetic chemical element with symbol Hs and atomic number 108. It is named after the German state of Hesse. It is a synthetic element and radioactive; the most stable known isotope, 270Hs, has a half-life of approximately 10 seconds. In the periodic table of the elements, it is a d-block transactinide element. Hassium is a member of the 7th period and belongs to the group 8 elements: it is thus the sixth member of the 6d series of transition metals. Chemistry experiments have confirmed that hassium behaves as the heavier homologue to osmium in group 8. The chemical properties of hassium are characterized only partly, but they compare well with the chemistry of the other group 8 elements. In bulk quantities, hassium is expected to be a silvery metal that reacts readily with oxygen in the air, forming a volatile tetroxide. The synthesis of element 108 was first attempted in 1978 by a research team led by Yuri Oganessian at the Joint Institute for Nuclear Research (JINR) in Dubna, Moscow Oblast, Russian SFSR, Soviet Union. The team used a reaction that would generate 270108 from radium and calcium. The researchers were uncertain in interpreting result data; the paper did not unambiguously claim discovery. That same year, another team at JINR investigated the possibility of synthesis of element 108 in reactions between lead and iron; they were uncertain in interpreting result data as well, openly suggesting a possibility that element 108 had not been created. New experiments were performed in 1983. In each experiment, a thin layer of a target material was installed on a rotating wheel and bombarded at a shallow angle. This was made so that fission fragments from spontaneously fissioning nuclides formed could escape the target and be detected in a number of fission track detectors surrounding the wheel. The experiments probably resulted in synthesis of element 108: bismuth was bombarded with manganese to obtain 263108, lead was bombarded with iron to obtain 264108, and californium was bombarded with neon to obtain 270108. These experiments were not claimed as a discovery and were only announced by Oganessian in a conference rather than in a written report. In 1984, researchers in Dubna published a written report. The researchers performed a number of experiments set up as the previous ones with, bombarding target materials (bismuth and lead) with ions of lighter element (manganese and iron, correspondingly). Also in 1984, a research team led by Peter Armbruster and Gottfried Münzenberg at the Gesellschaft für Schwerionenforschung (GSI; Institute for Heavy Ion Research) in Darmstadt, Hesse, West Germany, attempted to create element 108. The team bombarded a target of lead with accelerated nuclei of iron. They reported synthesis of 3 atoms of 265108. In 1985, the International Union of Pure and Applied Chemistry (IUPAC) and the International Union of Pure and Applied Physics (IUPAP) formed a Joint Working Party (JWP) to assess discoveries and establish final names for the elements with atomic number greater than 100. The party held meetings with delegates from the three competing institutes; in 1990, they established criteria on recognition of an element, and in 1991, they finished the work on assessing discoveries, and disbanded. These results were published in 1993. According to the report, the 1984 works from JINR and GSI simultaneously independently established synthesis of element 108. Of the two 1984 works, the one from GSI was said to be sufficient as a discovery on its own, while the JINR work, which preceded the GSI one, "very probably" displayed synthesis of element 108, but that is determined in retrospect given the work from Darmstadt. The report concluded that the major credit should be awarded to GSI. According to Mendeleev's nomenclature for unnamed and undiscovered elements, hassium should be known as eka-osmium. In 1979, IUPAC published recommendations according to which the element was to be called unniloctium (with the corresponding symbol of Uno), a systematic element name as a placeholder, until the element was discovered (and the discovery then confirmed) and a permanent name was decided on. Although widely used in the chemical community on all levels, from chemistry classrooms to advanced textbooks, the recommendations were mostly ignored among scientists in the field, who either called it "element 108", with the symbol of E108, (108), or even simply 108, or used the proposed name "hassium". The name hassium was proposed by Peter Armbruster and his colleagues, the officially recognised German discoverers, in September 1992. It is derived from the Latin name Hassia for the German state of Hesse where the institute is located. In 1994, IUPAC Commission on Nomenclature of Inorganic Chemistry recommended that element 108 be named hahnium (Hn) after the German physicist Otto Hahn so that elements named after Hahn and Lise Meitner (meitnerium) would be next to each other, honoring their joint discovery of nuclear fission. This was because they felt that Hesse did not merit an element being named after it. GSI protested saying that this contradicted the long-standing convention to give the discoverer the right to suggest a name; the American Chemical Society supported the GSI. IUPAC relented and the name hassium (Hs) was adopted internationally in 1997. Hassium is not known to occur naturally on Earth; the half-lives of all its known isotopes are short enough that no primordial hassium would have survived to the present day. This does not rule out the possibility of unknown longer-lived isotopes or nuclear isomers existing, some of which could still exist in trace quantities today if they are long-lived enough. In the early 1960s, it was predicted that long-lived deformed isomers of hassium might occur naturally on Earth in trace quantities. This was theorized in order to explain the extreme radiation damage in some minerals that could not have been caused by any known natural radioisotopes, but could have been caused by superheavy elements. In 1963, Soviet scientist Viktor Cherdyntsev, who had previously claimed the existence of primordial curium-247, claimed to have discovered element 108 (specifically, the 267Hs isotope, which supposedly had a half-life of 400 to 500 million years) in natural molybdenite and suggested the name sergenium (symbol Sg; at the time, this symbol had not yet been taken by seaborgium) for it; this name takes its origin in the name for the Silk Road and was explained as "coming from Kazakhstan". His rationale for claiming that sergenium was the heavier homologue to osmium was that minerals supposedly containing sergenium formed volatile oxides when boiled in nitric acid, similarly to osmium. His findings were criticized by Soviet physicist Vladimir Kulakov on the grounds that some of the properties Cherdyntsev claimed sergenium had were inconsistent with the then-current nuclear physics. The chief questions raised by Kulakov were that the claimed alpha decay energy of sergenium was many orders of magnitude lower than expected and the half-life given was eight orders of magnitude shorter than what would be predicted for a nuclide alpha decaying with the claimed decay energy, but at the same time a corrected half-life in the region of 1016 years would be impossible as it would imply that the samples contained about 100 milligrams of sergenium. In 2003 it was suggested that the observed alpha decay with energy 4.5 MeV could be due to a low-energy and strongly enhanced transition between different hyperdeformed states of a hassium isotope around 271Hs, thus suggesting that the existence of superheavy elements in nature was at least possible, although unlikely. In 2004, the Joint Institute for Nuclear Research conducted a search for natural hassium. This was done underground to avoid interference and false positives from cosmic rays, but no results have been released, strongly implying that no natural hassium was found. The possible extent of primordial hassium on Earth is uncertain; it might now only exist in traces, or could even have completely decayed by now after having caused the radiation damage long ago. In 2006, it was hypothesized that an isomer of 271Hs might have a half-life of around 7008250000000000000♠(2.5±0.5)×108 years, which would explain the observation of alpha particles with energies of around 4.4 MeV in some samples of molybdenite and osmiridium. This isomer of 271Hs could be produced from the beta decay of 271Bh and 271Sg, which, being homologous to rhenium and molybdenum respectively, should occur in molybdenite along with rhenium and molybdenum if they occurred in nature. Since hassium is homologous to osmium, it should also occur along with osmium in osmiridium if it occurred in nature. The decay chains of 271Bh and 271Sg are very hypothetical and the predicted half-life of this hypothetical hassium isomer is not long enough for any sufficient quantity to remain on Earth. It is possible that more 271Hs may be deposited on the Earth as the Solar System travels through the spiral arms of the Milky Way, which would also explain excesses of plutonium-239 found on the floors of the Pacific Ocean and the Gulf of Finland, but minerals enriched with 271Hs are predicted to also have excesses of uranium-235 and lead-207, and would have different proportions of elements that are formed during spontaneous fission, such as krypton, zirconium, and xenon. Thus, the occurrence of hassium in nature in minerals such as molybdenite and osmiride is theoretically possible, but highly unlikely. A 2007 calculation on the decay properties of unknown neutron-rich isotopes of superheavy elements suggested that the isotope 292Hs may be the most stable superheavy nucleus against alpha decay and spontaneous fission, as a consequence of the shell closure at N = 184. As such, it was considered as a candidate to exist in nature. However, this nucleus is predicted to be highly unstable toward beta decay, and any beta-stable isotopes of hassium (such as 286Hs) would be too unstable in the other decay channels to possibly be observed in nature. Indeed, a subsequent search for 292Hs in nature along with its congener osmium was unsuccessful, setting an upper limit to its abundance at 6985300000000000000♠3×10−15 grams of hassium per gram of osmium. Hassium has no stable or naturally occurring isotopes. Several radioactive isotopes have been synthesized in the laboratory, either by fusing two atoms or by observing the decay of heavier elements. Twelve different isotopes have been reported with atomic masses from 263 to 277 (with the exceptions of 272, 274, and 276), three of which, hassium-265, hassium-267, hassium-269, have known metastable states. Most of these decay predominantly through alpha decay, but some also undergo spontaneous fission. The lightest isotopes, which usually have shorter half-lives were synthesized by direct fusion between two lighter nuclei and as decay products. The heaviest isotope produced by direct fusion is 271Hs; heavier isotopes have only been observed as decay products of elements with larger atomic numbers. In 1999, scientists at University of California in Berkeley, California, United States, announced that they had succeeded in synthesizing three atoms of 293Og. These parent nuclei were reported to have successively emitted three alpha particles to form hassium-273 nuclei, which were claimed to have undergone an alpha decay, emitting alpha particles with decay energies of 9.78 and 9.47 MeV and half-life 1.2 s, but their claim was retracted in 2001, as the data was found to be fabricated. The isotope was successfully produced in 2010 by the same team. The new data matched the previous (fabricated) data. According to calculations, 108 is a proton magic number for deformed nuclei (nuclei that are far from spherical), and 162 is a neutron magic number for deformed nuclei. This means that such nuclei are permanently deformed in their ground state but have high, narrow fission barriers to further deformation and hence relatively long life-times to spontaneous fission. The spontaneous fission half-lives in this region are typically reduced by a factor of 109 in comparison with those in the vicinity of the spherical doubly magic nucleus 298Fl, caused by the narrower fission barrier for such deformed nuclei. Hence, the nucleus 270Hs has promise as a deformed doubly magic nucleus. Experimental data from the decay of the darmstadtium (Z=110) isotopes 271Ds and 273Ds provides strong evidence for the magic nature of the N=162 sub-shell. The syntheses of 269Hs, 270Hs, and 271Hs also fully support the assignment of N=162 as a magic number. In particular, the low decay energy for 270Hs is in complete agreement with calculations. Evidence for the magicity of the Z=108 proton shell can be obtained from two sources: the variation in the partial spontaneous fission half-lives for isotones and the large gap in the alpha Q value for isotonic nuclei of hassium and darmstadtium. For spontaneous fission, it is necessary to measure the half-lives for the isotonic nuclei 268Sg, 270Hs and 272Ds. Since the isotopes 268Sg and 272Ds are not currently known, and fission of 270Hs has not been measured, this method cannot yet be used to confirm the stabilizing nature of the Z=108 shell. Good evidence for the magicity of the Z=108 shell can nevertheless be found from the large differences in the alpha decay energies measured for 270Hs, 271Ds and 273Ds. More conclusive evidence would come from the determination of the decay energy for the unknown nucleus 272Ds. Various calculations show that hassium should be the heaviest known group 8 element, consistent with the periodic law. Its properties should generally match those expected for a heavier homologue of osmium, with a few deviations arising from relativistic effects. The previous members of group 8 have relatively high melting points (Fe, 1538 °C; Ru, 2334 °C; Os, 3033 °C). Much like them, hassium is predicted to be a solid at room temperature, although the melting point of hassium has not been precisely calculated. Hassium should crystallize in the hexagonal close-packed structure (c/a = 1.59), similarly to its lighter congener osmium. Pure metallic hassium is calculated to have a bulk modulus (resistance to uniform compression) comparable to that of diamond (442 GPa). Hassium is expected to have a bulk density of 40.7 g/cm3, the highest of any of the 118 known elements and nearly twice the density of osmium, the most dense measured element, at 22.61 g/cm3. This results from hassium's high atomic weight, the lanthanide and actinide contractions, and relativistic effects, although production of enough hassium to measure this quantity would be impractical, and the sample would quickly decay. Osmium is the densest element of the first 6 periods, and its heavier congener hassium is expected to be the densest element of the first 7 periods. The atomic radius of hassium is expected to be around 126 pm. Due to the relativistic stabilization of the 7s orbital and destabilization of the 6d orbital, the Hs+ ion is predicted to have an electron configuration of [Rn] 5f14 6d5 7s2, giving up a 6d electron instead of a 7s electron, which is the opposite of the behavior of its lighter homologues. On the other hand, the Hs2+ ion is expected to have an electron configuration of [Rn] 5f14 6d5 7s1, analogous to that calculated for the Os2+ ion. Hassium is the sixth member of the 6d series of transition metals and is expected to be much like the platinum group metals. Calculations on its ionization potentials, atomic radius, as well as radii, orbital energies, and ground levels of its ionized states are similar to that of osmium, implying that hassium's properties would resemble those of the other group 8 elements, iron, ruthenium, and osmium. Some of these properties were confirmed by gas-phase chemistry experiments. The group 8 elements portray a wide variety of oxidation states, but ruthenium and osmium readily portray their group oxidation state of +8 (the second-highest known oxidation state for any element, which is very rare for other elements) and this state becomes more stable as the group is descended. Thus hassium is expected to form a stable +8 state. Analogously to its lighter congeners, hassium is expected to also show other stable lower oxidation states, such as +6, +5, +4, +3, and +2. Indeed, hassium(IV) is expected to be more stable than hassium(VIII) in aqueous solution. 4. Oxidation of ruthenium metal in air forms the dioxide, RuO2. In contrast, osmium burns to form the stable tetroxide, OsO4, which complexes with the hydroxide ion to form an osmium(VIII) -ate complex, [OsO4(OH)2]2−. Therefore, eka-osmium properties for hassium should be demonstrated by the formation of a stable, very volatile tetroxide HsO4, which undergoes complexation with hydroxide to form a hassate(VIII), [HsO4(OH)2]2−. Ruthenium tetroxide and osmium tetroxide are both volatile, due to their symmetrical tetrahedral molecular geometry and their being charge-neutral; hassium tetroxide should similarly be a very volatile solid. The trend of the volatilities of the group 8 tetroxides is known to be RuO4 < OsO4 > HsO4, which completely confirms the calculated results. In particular, the calculated enthalpies of adsorption (the energy required for the adhesion of atoms, molecules, or ions from a gas, liquid, or dissolved solid to a surface) of HsO4, −(45.4 ± 1) kJ/mol on quartz, agrees very well with the experimental value of 2995540000000000000♠−46±2 kJ/mol. Despite the fact that the selection of a volatile hassium compound (hassium tetroxide) for gas-phase chemical studies was clear from the beginning, the chemical characterization of hassium was considered a difficult task for a long time. Although hassium isotopes were first synthesized in 1984, it was not until 1996 that a hassium isotope long-lived enough to allow chemical studies to be performed was synthesized. Unfortunately, this hassium isotope, 269Hs, was then synthesized indirectly from the decay of 277Cn; not only are indirect synthesis methods not favourable for chemical studies, but also the reaction that produced the isotope 277Cn had a low yield (its cross-section was only 1 pb), and thus did not provide enough hassium atoms for a chemical investigation. The direct synthesis of 269Hs and 270Hs in the reaction 248Cm(26Mg,xn)274−xHs (x = 4 or 5) appeared more promising, as the cross-section for this reaction was somewhat larger, at 7 pb. This yield was still around ten times lower than that for the reaction used for the chemical characterization of bohrium. New techniques for irradiation, separation, and detection had to be introduced before hassium could be successfully characterized chemically as a typical member of group 8 in early 2001. Ruthenium and osmium have very similar chemistry due to the lanthanide contraction, but iron shows some differences from them: for example, although ruthenium and osmium form stable tetroxides in which the metal is in the +8 oxidation state, iron does not. Consequently, in preparation for the chemical characterization of hassium, researches focused on ruthenium and osmium rather than iron, as hassium was expected to also be similar to ruthenium and osmium due to the actinide contraction. Nevertheless, in the planned experiment to study hassocene (Hs(C5H5)2), ferrocene may also be used for comparison along with ruthenocene and osmocene. In ferrocene, the cyclopentadienyl rings are in a staggered conformation. In ruthenocene and osmocene, the cyclopentadienyl rings are in an eclipsed conformation. 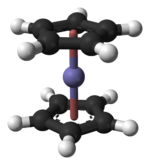 Hassocene is predicted to also have this structure. The first chemistry experiments were performed using gas thermochromatography in 2001, using 172Os and 173Os as a reference. During the experiment, 5 hassium atoms were synthesized using the reaction 248Cm(26Mg,5n)269Hs. They were then thermalized and oxidized in a mixture of helium and oxygen gas to form the tetroxide. The measured deposition temperature indicated that hassium(VIII) oxide is less volatile than osmium tetroxide, OsO4, and places hassium firmly in group 8. However, the enthalpy of adsorption for HsO4 measured, 2998540000000000000♠−46±2 kJ/mol, was significantly lower than what was predicted, 2995633000000000000♠−36.7±1.5 kJ/mol, indicating that OsO4 was more volatile than HsO4, contradicting earlier calculations, which implied that they should have very similar volatilities. For comparison, the value for OsO4 is 2995610000000000000♠−39±1 kJ/mol. It is possible that hassium tetroxide interacts differently with the different chemicals (silicon nitride and silicon dioxide) used for the detector; further research is required, including more accurate measurements of the nuclear properties of 269Hs and comparisons with RuO4 in addition to OsO4. The team from the University of Mainz were planning to study the electrodeposition of hassium atoms using the new TASCA facility at the GSI. Their aim was to use the reaction 226Ra(48Ca,4n)270Hs. In addition, scientists at the GSI were hoping to utilize TASCA to study the synthesis and properties of the hassium(II) compound hassocene, Hs(C5H5)2, using the reaction 226Ra(48Ca,xn). This compound is analogous to the lighter ferrocene, ruthenocene, and osmocene, and is expected to have the two cyclopentadienyl rings in an eclipsed conformation like ruthenocene and osmocene and not in a staggered conformation like ferrocene. Hassocene was chosen because it has hassium in the low formal oxidation state of +2 (although the bonding between the metal and the rings is mostly covalent in metallocenes) rather than the high +8 state which had previously been investigated, and relativistic effects were expected to be stronger in the lower oxidation state. Many metals in the periodic table form metallocenes, so that trends could be more easily determined, and the highly symmetric structure of hassocene and its low number of atoms also make relativistic calculations easier. Hassocene should be a stable and highly volatile compound. ^ "Hassium". The Periodic Table of Videos. The University of Nottingham. Retrieved 19 October 2012. ^ a b c d e f g h i j k l Emsley, John (2011). Nature's Building Blocks: An A-Z Guide to the Elements (New ed.). New York, NY: Oxford University Press. p. 215–7. ISBN 978-0-19-960563-7. ^ a b c d e f g h i j k l m n o p q r s t u v w x Hoffman, Darleane C.; Lee, Diana M.; Pershina, Valeria (2006). "Transactinides and the future elements". In Morss; Edelstein, Norman M.; Fuger, Jean (eds.). The Chemistry of the Actinide and Transactinide Elements (3rd ed.). Dordrecht, The Netherlands: Springer Science+Business Media. ISBN 1-4020-3555-1. ^ a b c d e Östlin, A.; Vitos, L. (2011). "First-principles calculation of the structural stability of 6d transition metals". Physical Review B. 84 (11). Bibcode:2011PhRvB..84k3104O. doi:10.1103/PhysRevB.84.113104. ^ Fricke, Burkhard (1975). "Superheavy elements: a prediction of their chemical and physical properties". Recent Impact of Physics on Inorganic Chemistry. 21: 89–144. doi:10.1007/BFb0116498. Retrieved 4 October 2013. ^ a b c d e f Düllmann, Christoph E. (31 October 2008). "Investigation of group 8 metallocenes @ TASCA" (PDF). 7th Workshop on Recoil Separator for Superheavy Element Chemistry TASCA 08. Gesellschaft für Schwerionenforschung. Retrieved 25 March 2013. ^ Robertson, Murray (2011). "Chemical Data: Hassium". Visual Elements Periodic Table. Royal Society of Chemistry. Retrieved 28 November 2012. ^ Oganessian, Yu. Ts. ; Ter-Akopian, G. M.; Pleve, A. A.; et al. (1978). Опыты по синтезу 108 элемента в реакции 226Ra + 48Ca [Experiments on the synthesis of element 108 in the 226Ra+48Ca reaction] (PDF) (Report) (in Russian). Joint Institute for Nuclear Research. Retrieved 8 June 2018. ^ Orlova, O. A.; Pleve, A. A.; Ter-Akop'yan, G. M.; et al. (1979). Опыты по синтезу 108 элемента в реакции 208Pb + 58Fe [Experiments on the synthesis of element 108 in the 208Pb + 58Fe reaction] (PDF) (Report) (in Russian). Joint Institute for Nuclear Research. ^ "Hassium". Royal Society of Chemistry. Retrieved 8 June 2018. ^ a b c Barber, Robert C.; Greenwood, N. N.; Hrynkiewicz, A. Z.; et al. (1993). "Discovery of the Transfermium elements" (PDF). Pure and Applied Chemistry. 65 (8): 1757. doi:10.1351/pac199365081757. Retrieved 7 September 2016. ^ a b c Münzenberg, G.; Armbruster, P.; Folger, H.; et al. (1984). "The identification of element 108" (PDF). Zeitschrift für Physik A. 317 (2): 235–236. Bibcode:1984ZPhyA.317..235M. doi:10.1007/BF01421260. Archived from the original (PDF) on 18 November 2012. Retrieved 20 October 2012. ^ Barber, R. C.; Greenwood, N. N.; Hrynkiewicz, A. Z.; Jeannin, Y. P.; Lefort, M.; Sakai, M.; Ulehla, I.; Wapstra, A. P.; Wilkinson, D. H. (1993). "Discovery of the transfermium elements. Part II: Introduction to discovery profiles. Part III: Discovery profiles of the transfermium elements". Pure and Applied Chemistry. 65 (8): 1757. doi:10.1351/pac199365081757. For Part I see Wapstra, A. H. (1991). "Criteria that must be satisfied for the discovery of a new chemical element to be recognized". Pure Appl. Chem. 63 (6): 879–886. doi:10.1351/pac199163060879. ^ Öhrström, Lars; Holden, Norman E. (19 March 2016). "The Three-Letter Element Symbols". Chemistry International. 38 (2): 4–8. doi:10.1515/ci-2016-0204. Retrieved 2 April 2019. ^ Ghiorso, A.; Seaborg, G. T.; Oganessian, Yu. Ts. ; et al. (1993). "Responses on the report 'Discovery of the Transfermium elements' followed by reply to the responses by Transfermium Working Group" (PDF). Pure and Applied Chemistry. 65 (8): 1815–1824. doi:10.1351/pac199365081815. Archived (PDF) from the original on 25 November 2013. Retrieved 7 September 2016. ^ Inorganic Chemistry Division: Commission on Nomenclature of Inorganic Chemistry (1994). "Names and symbols of transfermium elements (IUPAC Recommendations 1994)" (PDF). Pure and Applied Chemistry. 66 (12): 2419–2421. doi:10.1351/pac199466122419. ^ "IUPAC verabschiedet Namen für schwere Elemente: GSI-Vorschläge für die Elemente 107 bis 109 akzeptiert" [IUPAC adopts names for heavy elements: GSI's suggestions for elements 107 to 109 accepted] (PDF). GSI-Nachrichten (in German). Gesellschaft für Schwerionenforschung. March 1997. Retrieved 27 March 2013. ^ Commission on Nomenclature of Inorganic Chemistry (1997). "Names and symbols of transfermium elements (IUPAC Recommendations 1997)" (PDF). Pure and Applied Chemistry. 69 (12): 2471–2474. doi:10.1351/pac199769122471. ^ Cherdyntsev, V. V.; Mikhailov, V. F. (1963). "The Primordial Transuranium Isotope in Nature". Geokhimiya. 1: 3–14. OSTI 4748393. ^ Nikitin, A. (1970). "Новый трансуран найден в природе" [New transuranium found in nature]. Nauka i zhizn (in Russian). 2: 102–106. ^ Kulakov, V. M. (1970). "Has element 108 been discovered?". Soviet Atomic Energy. 29 (5): 1166–8. doi:10.1007/BF01666716. ^ Marinov, A.; Gelberg, S.; Kolb, D.; Brandt, R.; Pape, A. (2003). "New outlook on the possible existence of superheavy elements in nature". Physics of Atomic Nuclei. 66 (6): 1137–45. arXiv:nucl-ex/0210039. Bibcode:2003PAN....66.1137M. doi:10.1134/1.1586428. ^ a b c Ivanov, A. V. (2006). "The possible existence of Hs in nature from a geochemical point of view". Physics of Particles and Nuclei Letters. 3 (3): 165–168. arXiv:nucl-th/0604052. Bibcode:2006PPNL....3..165I. doi:10.1134/S1547477106030046. ^ Karpov, A.V. ; Zagrebaev, V.I. ; Palenzuela, Y.M. ; Ruiz, L.F.; Greiner, W. (2012). "Decay properties and stability of the heaviest elements" (PDF). International Journal of Modern Physics E. 21 (2): 1250013–1—1250013–20. doi:10.1142/S0218301312500139. ^ a b Oganessian, Y. (2007). "Heaviest nuclei from 48Ca-induced reactions" (PDF). Journal of Physics G: Nuclear and Particle Physics. 34: R165–R242. doi:10.1088/0954-3899/34/4/R01. ^ Ludwig, P.; Faestermann, T.; Korschinek, G.; Rugel, G.; Dillmann, I.; Fimiani, L.; Bishop, S.; Kumar, P. (2012). "Search for superheavy elements with 292 ≤ A ≤ 310 in nature with accelerator mass spectrometry" (PDF). Physical Review C. 85 (2): 024315–1—024315–8. doi:10.1103/PhysRevC.85.024315. ^ a b c d e Sonzogni, Alejandro. "Interactive Chart of Nuclides". National Nuclear Data Center: Brookhaven National Laboratory. Retrieved 6 June 2008. ^ Dragojević, I.; Gregorich, K.; Düllmann, Ch. ; Dvorak, J.; Ellison, P.; Gates, J.; Nelson, S.; Stavsetra, L.; Nitsche, H. (2009). "New Isotope 263Hs". Physical Review C. 79 (1): 011602. Bibcode:2009PhRvC..79a1602D. doi:10.1103/PhysRevC.79.011602. ^ Münzenberg, G.; Armbruster, P.; Berthes, G.; Folger, H.; Heßberger, F. P.; Hofmann, S.; Poppensieker, K.; Reisdorf, W.; Quint, B.; et al. (1986). "Evidence for264108, the heaviest known even-even isotope". Zeitschrift für Physik A. 324 (4): 489–490. Bibcode:1986ZPhyA.324..489M. doi:10.1007/BF01290935. ^ Hofmann, S.; Heßberger, F. P.; Ackermann, D.; Antalic, S.; Cagarda, P.; Ćwiok, S.; Kindler, B.; Kojouharova, J.; Lommel, B.; et al. (2001). "The new isotope 270110 and its decay products 266Hs and 262Sg" (PDF). Eur. Phys. J. A. 10 (1): 5–10. Bibcode:2001EPJA...10....5H. doi:10.1007/s100500170137. ^ a b Lazarev, Yu. A.; Lobanov, Y. V.; Oganessian, Y. T.; Tsyganov, Y. S.; Utyonkov, V. K.; Abdullin, F. S.; Iliev, S.; Polyakov, A. N.; Rigol, J.; et al. (1995). "New Nuclide 267108 Produced by the 238U + 34S Reaction" (PDF). Physical Review Letters. 75 (10): 1903–1906. Bibcode:1995PhRvL..75.1903L. doi:10.1103/PhysRevLett.75.1903. PMID 10059158. ^ Hofmann, S.; et al. (1996). "The new element 112". Zeitschrift für Physik A. 354 (1): 229–230. doi:10.1007/BF02769517. ^ "Decay properties of 269Hs and evidence for the new nuclide 270Hs" Archived 2012-11-18 at WebCite, Turler et al., GSI Annual Report 2001. Retrieved 2008-03-01. ^ Dvorak, Jan (25 September 2006). "On the production and chemical separation of Hs (element 108)" (PDF). Technical University of Munich. Archived from the original (PDF) on 25 February 2009. Retrieved 23 December 2012. ^ Utyonkov, V. K.; Brewer, N. T.; Oganessian, Yu. Ts. ; Rykaczewski, K. P.; Abdullin, F. Sh. ; Dimitriev, S. N.; Grzywacz, R. K.; Itkis, M. G.; Miernik, K.; Polyakov, A. N.; Roberto, J. B.; Sagaidak, R. N.; Shirokovsky, I. V.; Shumeiko, M. V.; Tsyganov, Yu. S.; Voinov, A. A.; Subbotin, V. G.; Sukhov, A. M.; Karpov, A. V.; Popeko, A. G.; Sabel'nikov, A. V.; Svirikhin, A. I.; Vostokin, G. K.; Hamilton, J. H.; Kovrinzhykh, N. D.; Schlattauer, L.; Stoyer, M. A.; Gan, Z.; Huang, W. X.; Ma, L. (30 January 2018). "Neutron-deficient superheavy nuclei obtained in the 240Pu+48Ca reaction". Physical Review C. 97 (14320): 1–10. Bibcode:2018PhRvC..97a4320U. doi:10.1103/PhysRevC.97.014320. ^ a b c "Six New Isotopes of the Superheavy Elements Discovered " Berkeley Lab News Center". Newscenter.lbl.gov. Retrieved 27 February 2011. ^ Oganessian, Yu. Ts. ; Yeremin, A. V.; Popeko, A. G.; Bogomolov, S. L.; Buklanov, G. V.; Chelnokov, M. L.; Chepigin, V. I.; Gikal, B. N.; Gorshkov, V. A.; et al. (1999). "Synthesis of nuclei of the superheavy element 114 in reactions induced by 48Ca". Nature. 400 (6741): 242–245. Bibcode:1999Natur.400..242O. doi:10.1038/22281. ". Physical Review Letters. 83 (6): 1104–1107. Bibcode:1999PhRvL..83.1104N. doi:10.1103/PhysRevLett.83.1104. ^ Public Affairs Department (21 July 2001). "Results of element 118 experiment retracted". Berkeley Lab. Archived from the original on 29 January 2008. Retrieved 18 January 2008. ^ a b c Mason Inman (14 December 2006). "A Nuclear Magic Trick". Physical Review Focus. Retrieved 25 December 2006. ^ a b c d Dvorak, J.; Brüchle, W.; Chelnokov, M.; Dressler, R.; Düllmann, Ch. E.; Eberhardt, K.; Gorshkov, V.; Jäger, E.; et al. (2006). "Doubly Magic Nucleus 108270Hs162". Physical Review Letters. 97 (24): 242501. Bibcode:2006PhRvL..97x2501D. doi:10.1103/PhysRevLett.97.242501. PMID 17280272. ^ a b c d e f Robert Smolańczuk (1997). "Properties of the hypothetical spherical superheavy nuclei". Physical Review C. 56 (2): 812–824. Bibcode:1997PhRvC..56..812S. doi:10.1103/PhysRevC.56.812. ^ Grossman, Jeffery C.; Mizel, Ari; Côté, Michel; Cohen, Marvin L.; Louie, Steven G. (1999). "Transition metals and their carbides and nitrides: Trends in electronic and structural properties". Phys. Rev. B. 60 (9): 6343–7. Bibcode:1999PhRvB..60.6343G. doi:10.1103/PhysRevB.60.6343. Retrieved 6 August 2013. ^ Cohen, Marvin (1985). "Calculation of bulk moduli of diamond and zinc-blende solids". Phys. Rev. B. 32 (12): 7988–7991. Bibcode:1985PhRvB..32.7988C. doi:10.1103/PhysRevB.32.7988. ^ a b Arblaster, J. W. (1989). "Densities of osmium and iridium: recalculations based upon a review of the latest crystallographic data" (PDF). Platinum Metals Review. 33 (1): 14–16. ^ a b Greenwood, Norman N.; Earnshaw, Alan (1997). Chemistry of the Elements (2nd ed.). Butterworth-Heinemann. ISBN 978-0-08-037941-8. , pp. 27–28. ^ a b Griffith, W. P. (2008). "The Periodic Table and the Platinum Group Metals". Platinum Metals Review. 52 (2): 114–119. doi:10.1595/147106708X297486. ^ "Element 108, hassium, Hs". Archived from the original on 6 February 2013. Retrieved 17 November 2012. ^ a b Düllmann, Ch. E.; Dressler, R.; Eichler, B.; Gäggeler, H. W.; Glaus, F.; Jost, D. T.; Piguet, D.; Soverna, S.; et al. (2003). "First chemical investigation of hassium (Hs, Z=108)". Czechoslovak Journal of Physics. 53 (1 Supplement): A291–A298. Bibcode:2003CzJPS..53A.291D. doi:10.1007/s10582-003-0037-4. ^ a b c "Chemistry of Hassium" (PDF). Gesellschaft für Schwerionenforschung mbH. 2002. Retrieved 31 January 2007. ^ a b c d e f g h i j k Schädel, Matthias (2003). The Chemistry of Superheavy Elements. Springer. p. 269. ISBN 978-1402012501. Retrieved 17 November 2012. ^ Barnard, C. F. J.; Bennett (2004). "Oxidation States of Ruthenium and Osmium". Platinum Metals Review. 48 (4): 157–158. doi:10.1595/147106704X10801. ^ a b Yurii D. Perfiliev; Virender K. Sharma (2008). "Higher Oxidation States of Iron in Solid State: Synthesis and Their Mössbauer Characterization – Ferrates – ACS Symposium Series (ACS Publications)". Platinum Metals Review. 48 (4): 157–158. doi:10.1595/147106704X10801. ^ Gutsev, Gennady L.; Khanna, S.; Rao, B.; Jena, P. (1999). "FeO4: A unique example of a closed-shell cluster mimicking a superhalogen". Physical Review A. 59 (5): 3681–3684. Bibcode:1999PhRvA..59.3681G. doi:10.1103/PhysRevA.59.3681. ^ Cotton, S. A. (1997). Chemistry of Precious Metals. London: Chapman and Hall. ISBN 978-0-7514-0413-5. ^ Martín, V. S.; Palazón, J. M.; Rodríguez, C. M.; Nevill, C. R. (2006). "Ruthenium(VIII) Oxide". Encyclopedia of Reagents for Organic Synthesis. doi:10.1002/047084289X.rr009.pub2. ISBN 978-0471936237. ^ G.M. Brown & J.H. Butler (1997) New method for the characterization of domain morphology of polymer blends using ruthenium tetroxide staining and low voltage scanning electron microscopy (LVSEM). Polymer 38, (15), 3937–3945. ^ Mager Stellman, J. (1998). "Osmium". Encyclopaedia of Occupational Health and Safety. International Labour Organization. p. 63.34. ISBN 978-92-2-109816-4. OCLC 35279504. ^ Housecroft, C. E.; Sharpe, A. G. (2004). Inorganic Chemistry (2nd ed.). Prentice Hall. pp. 671–673, 710. ISBN 978-0-13-039913-7. ^ Thompson, M. "Osmium tetroxide (OsO4)". Bristol University. Retrieved 7 April 2012. ^ Pershina, V.; Anton, J.; Jacob, T. (18 September 2008). "Fully relativistic density-functional-theory calculations of the electronic structures of MO4 (M = Ru, Os, and element 108, Hs) and prediction of physisorption". Physical Review A. 78 (3): 032518. Bibcode:2008PhRvA..78c2518P. doi:10.1103/PhysRevA.78.032518. ^ Düllmann, Ch. E.; Brüchle, W.; Dressler, R.; Eberhardt, K.; Eichler, B.; Eichler, R.; Gäggeler, H. W.; Ginter, T. N.; et al. (22 August 2002). "Chemical investigation of hassium (element 108)". Nature. 418 (6900): 859–862. Bibcode:2002Natur.418..859D. doi:10.1038/nature00980. PMID 12192405. Retrieved 18 November 2012. Hassium Becomes Heaviest Element To Have Its Chemistry Studied: Paul Preuss, Lawrence Berkeley National Laboratory. 5 June 2001.